I'd like to post a public service announcement for all of you people out there who think you are safe, secure or smart when in reality you are none of the above. 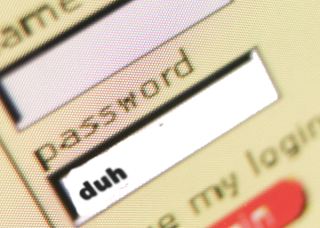 The FBI has come out with it's list of the most common passwords. Before I list it I'd like to tell you a couple of things. Anonymous has posted public information about police departments and posted credit card data from several sites including SpecialForces.com & Stratfor Global Intelligence. A local chain of 'LUCKY' supermarkets found out recently they has 'skimmers' attached to the self-checkout lanes. Lucky says at least 24 Bay area stores have been affected. I have had my ATM card 'canceled' by my bank twice in the last 6 months because of unknown reasons. All the bank would tell me is my card was 'at risk'. I'm glad they saved my card from certain harm but it still left me with an uneasy feeling. Times are changing and we are only going to see more of these types of behavior so please try not to make it easier for them to happen.